As promised, I'd like to introduce you to a fabulous jewelry designer I've had the pleasure of dealing and chatting with over some time now. She is not only a wonderful person, but she has the most beautiful, fresh and colorful (and affordable) jewelry, perfect for Lilly Pulitzer wearing weather! She is just fabulous and I know you will love her, and her jewelry, too! Kate is a third generation jewelry artist designing with sterling silver, semi-precious stones, sand dollar fossils and pearls. Her signature pieces are the Kiawah Starfish Collection (my favorite), Isle of Pearls, Beachwalker Charms and Sand Dollar Fossil Necklaces. Kate’s designs are sold in galleries in downtown Charleston, Kiawah Island, Seabrook Island, Daniel Island and select Florida resorts. 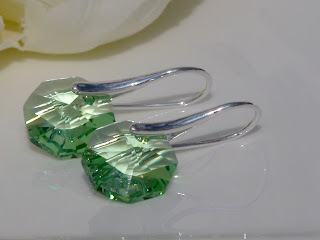 You can visit Kate on facebook at: www.facebook.com/katepuckjewels for current updates and special promotions. Stay tuned here for a special promotion just for SLPS readers! 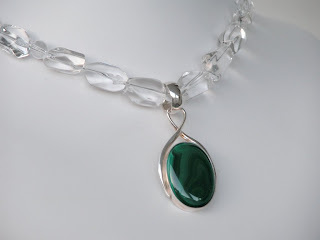 For a more formal, yet still very light and fresh spring look, I adore the Green With Envy necklace. I love the stone mixed with the clear necklace, it screams classy, but not stuffy. I can see some of my Kentucky friends heading off to Keeneland or the Kentucky Derby pairing this with a spring dress and hat. 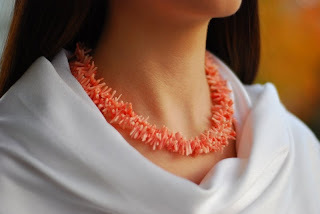 Coral has such a unique color and it pops against any skin color, fair, tan or dark. As you know, the latest fashion rule is to NOT match shoes and dress colors. So, can't you visualize this gorgeous necklace with a fresh white sundress with matching coral colored heeled sandals? Yes, I think maybe I do! Can't forget the ears. I know what all you Lilly lovers are thinking, perfect for Lilly's signature green patterns! Again, fresh with a pop of color without having an overbearing feel. I tend to stay away from long, dangly large earrings. It's just not my personality, but that doesn't mean I can't have fun and fresh color. These are definitely on my wish list! Last but not least, the wrist. 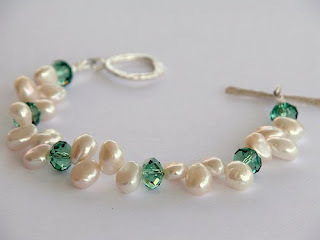 For some reason, I don't wear bracelets in the fall or winter, but spring and summer have my wrists adorned with all types of pearls, mostly pink freshwater (if you can imagine that I'd wear anything but pink). But now, I will be adding this Green Peas bracelet to my jewelry collection. Not to be redundant, but once again, fresh and light for casual shorts, church going or even more formal as a wedding or the horse races. So, aren't you just in love with Kate Puck now? Yes? Well you are in luck! Kate is offering my readers $20.00 off a $100.00 purchase. Just enter the code "preppy" at checkout! That's nearly a free pair of earrings! Don't delay, you must add these gorgeous pieces to your closet. You won't be surprised to see me in future posts wearing Kate Puck! Her work is lovely ~ I can't wait to see more. Jewelry tends to all look the same and become a blur after a while but these pieces really stand out!!! I am going to have a peek at her site! oh how pretty!! i especially love the last two pieces you posted!! thank you again for sending the books, btw - i just finished reading one of them and it was so good & light hearted!! great way to take my mind off the month left of deployment!! thank you again! Terrific Jewelry! and so sparkly! I've added her to my favorites. Those green earrings are so pretty. 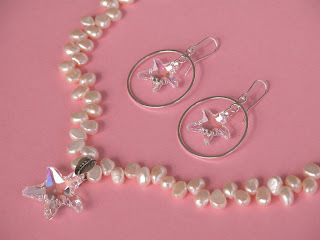 I love the starfish ones too!! !